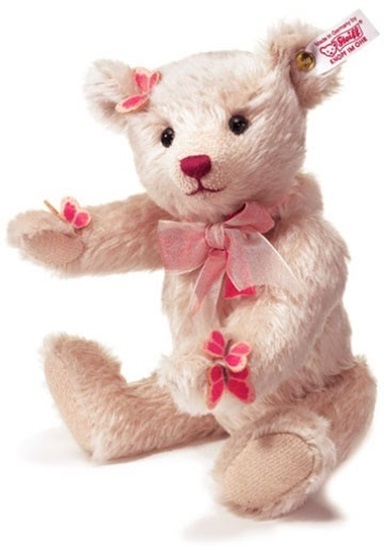 Designed for the 2013 Summer Festival held in Gingen, Germany, Sommer is a 10 inch teddy bear that is made from a pale pink mohair. Pink butterflies adorn her head, and legs. A sheer pink ribbon is tied in a bow around her neck. She has black glass eyes, and a dark pink hand stitched nose and mouth. Sommer is 5 way jointed and surface washable. She comes with the white tag "Button in Ear" and is a limited edition of 2013 pieces.